Weymouth - SMOOK Architecture & Urban Design, Inc.
SMOOK Architecture, working with Nitsch Engineering of Boston, the South Shore Chamber of Commerce, and the towns of Weymouth and Braintree, developed a master plan for 811,000 sq. ft. of mixed-use development in downtown Weymouth. With a population of 53,000, city officials believe that downtown Weymouth - known as “Weymouth Landing” - is ripe for growth and mixed-use development opportunities. 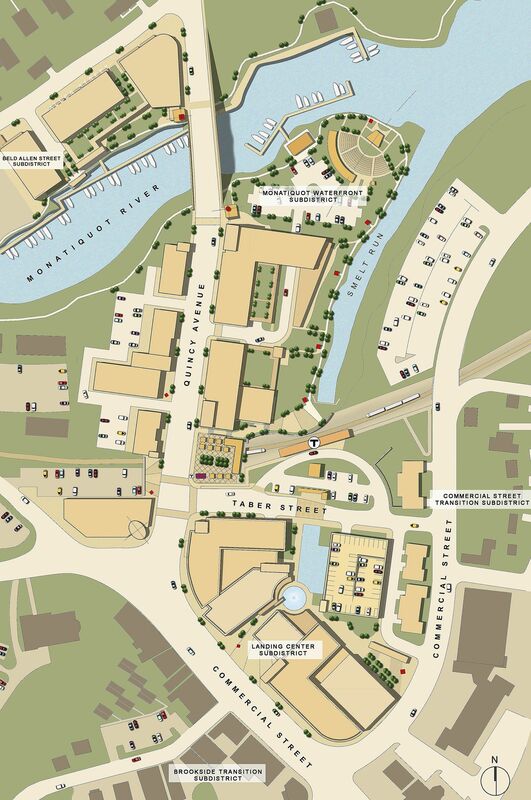 Following a Recommended Land Use Plan by the MAPC, SMOOK Architecture designed a phased development plan which reclaims the waterfront for waterfront uses, improves connections to the existing neighborhood, and takes advantage of existing transit and infrastructure. The Master Plan calls for restaurant /retail uses, office space, multi-unit residential, surface and structured parking, public parks, and a central public plaza. The plan is intended to be implemented incrementally in phases, as land parcels are consolidated.